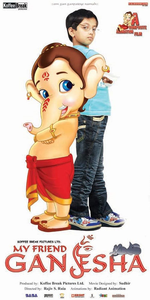 Review Summary: On the whole MY FRIEND GANESHA is a decent attempt that's targeted at the kids. On the whole MY FRIEND GANESHA is a decent attempt that's targeted at the kids. Is it time for Indian kids to celebrate our heritage of magical mythology? Not really for Hanuman seems to be the only winner here. Growing up isn't always easy, especially for the lonely and friendless brand of kids. Hindi cinema is truly evolving. Over last few years, if one God has gained 'popularity' amongst children, it is LORD GANESHA. You have Ganesha key rings, Ganesha pencil boxes, Ganesha TShirts, Ganesha school bags, Ganesha posters and numerous other accessories that have made children fond of the God.